then engage in your real-world environments. Connect with your customer on their devices. Engage with them based on an arrival notification at a location. Continue to engage in their digital world. Your customer is sent or given a Bluetooth-enabled card or key fob. This goes in their wallet or on their keys to help them find their things. They opt-in for the premium experience when they visit one of your locations. As your customer approaches, an alert is heard and notification appears on your team’s mobile and desktop devices. This gives your customer service team time to familiarize with the customer’s preferences and requirements so they can provide a premium experience. Based on their request and their nearby location, your team services their request. By industry this includes retail product preferences, food and beverage requests, flight change notifications and partner-aligned loyalty programs. As thin as credit card allows it to fit neatly into a your customers wallets or handbags. • Bluetooth LE 5 increased range. • Qi compatible wireless charging available. • Premium Key Finder are also an option. Gateways can be placed around your spaces to identify Bluetooth beacons within range. The gateway receives Bluetooth data from the customer’s device, which is shared via WiFi to the Administration Platform. Run a single site, multiple zones or scale up to global locations, all within the same front end software. • Secure, cloud-based, access anywhere interface. • Easily add and configure gateways to the system. • Configure the system with combinations of staff, internal users, customers, locations, zones, devices and gateways. • Rich reporting using historical customer activity and behaviour. • Customer knowledge database plus easy integrations back into existing systems. 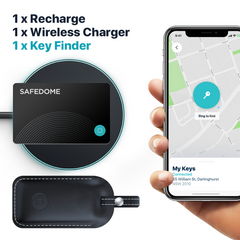 All Safedome CX products can connect with Safedome iOS and Android apps. This provides customers with the ability track and find their items via alerts if they go missing. 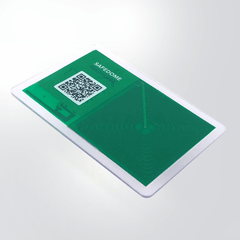 The Safedome cards, CX gateways, Customer Admin Platform, Safedome apps are available as a white-labelled solution. Discover how Safedome Premium CX can help connect your customers.